Drip, drop. Rain falls softly on the forest canopy. You peer into the mist. What wild creatures emerge? 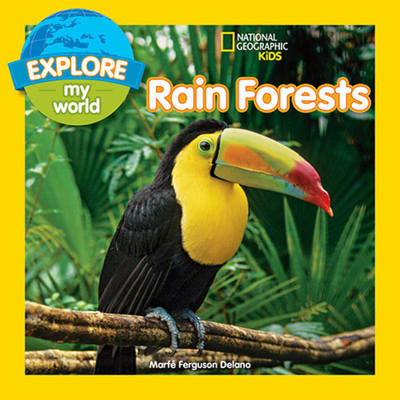 In this charming picture book, curious kids will learn all about the majesty of the rain forest, from jungle predators to colorful treetop birds to plants that thrive in this lush landscape. MARFÉ FERGUSON DELANO is the author of more than 20 books for National Geographic, including Genius, A Photobiograhy ofAlbert Einstein, which was an Orbis Pictus Honor Book, and Inventing the Future: A Photobiography of Thomas AlvaEdison. Her latest titles for National Geographic are Helen's Eyes, a Photobiography of Annie Sullivan, Master George's People, Explore My World: Butterflies, Explore My World: Frogs, Explore My World: Baby Animals, ExploreMy World: Clouds, Explore My World: A Tree Grows Up, and Welcome to the World. Delano is a graduate of Duke University.